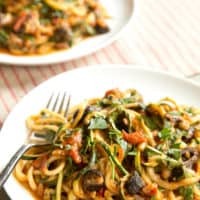 Vegan Zucchini Puttanesca Recipe | Good. Food. Stories. My mom was way ahead of the veggie noodle craze. Long before the idea of spiralizing everything swept the food world, she would serve roasted zucchini as a vegetable side dish for spaghetti in the spring and summer, and the zucchini and the tomato sauce would mix on my plate. It was a flavor combination I loved, and I would cut the rounds into strips so I could twirl it in with the pasta. I’ve written before about my love for all things briny, caper-y, and olive-y, so it should come as no surprise that, as an adult, my hands-down favorite pasta is puttanesca. The sweet warmth of the tomato combined with the zingy bite of brine is my idea of heaven—add the earthiness of garlic, the spice of red pepper, and brighten it with fresh parsley and you basically have a flavor combination that I could eat every day. But, while I would be happy to eat pasta puttanesca every day, my stomach … isn’t always. So a few years ago I decided that, if zucchini had tasted so good in my pasta as a kid, why wouldn’t it work as my pasta now? The story of the zoodle answers that one: it will! My point here isn’t to sing the praises of spiralizing every veggie in sight—I’ve never done it, but if it’s your thing, go for it! Rather, it excites me more that using zucchini in pasta puttanesca actually turns it into a different dish—an explicitly vegetable dish. I love vegetables. 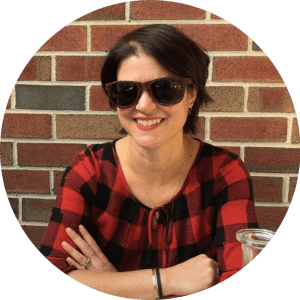 I love their versatility and how suggestible they are to the flavors they’re cooked with, and how good they make me feel when I eat them. I also have a wide group of friends and family who are vegetarian and vegan, so I feel strongly that vegetables are delicious as vegetables. I don’t want to pretend they’re pasta or pretend they’re meat; I’m not trying to sneak them into meals. I just love them, so I’m always looking for dishes that showcase their flavor. Zucchini is one of my favorites because it tastes so different depending on how it’s cooked. Grill it and it’s smoky, roast it and it’s mellow, stir fry it and it … well, it kind of disappears. Leave it raw and it’s sweet. And it’s this sweetness that pairs so well with the depth of flavor in a puttanesca preparation and transforms the dish from something intense and wintry to one that’s a little more approachable for spring. The completed dish has great depth and balance of flavor but is still light enough that I feel good after eating it. I enjoy cutting up the zucchini into long matchsticks by hand (the better to twirl around my fork, my dear). I find it calming and it fits perfectly in the time while the sauce is coming together. 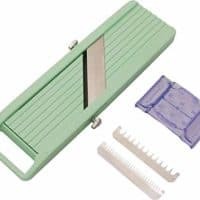 But if you have a spiralizer, go for that bad boy. Hell, Whole Foods now sells pre-spiralized zoodles that you can grab and add to a batch of puttanesca sauce you keep in the fridge. I think zucchini puttanesca works better as a bold side dish than its pasta cousin does. It pairs as beautifully with a sausage and bacon quiche as it does with lemony chicken or a huge salad. You can also serve it hot or cold. If you want to go cold, just keep the sauce and the zucchini separate until you’re about to serve so your zucchini doesn’t disintegrate. 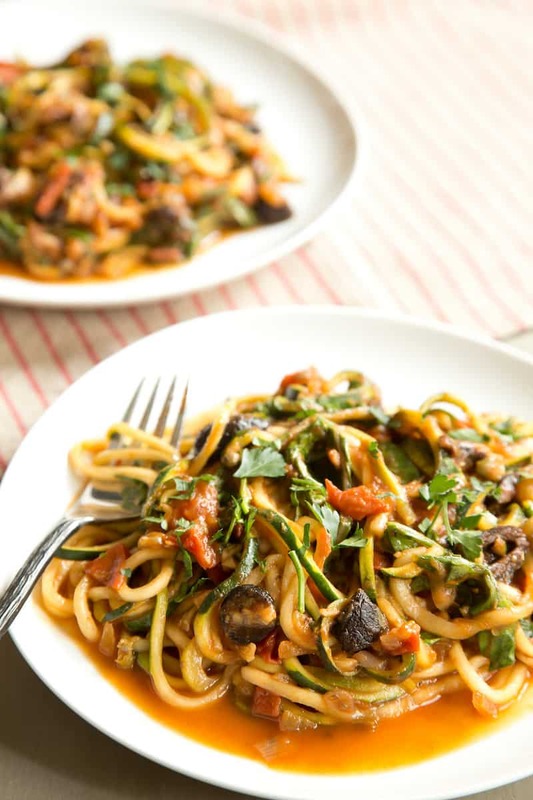 The biggest eye-opener from zucchini puttanesca isn’t about veggies acting like noodles. It’s about the way that I rarely think of pairing vegetables with actual sauces. Sure, I’ve often put daubs of pesto on roasted carrots and swiped sweet potatoes through bowls of dip. I’ve used them in stir fries, combined them with cold noodles and dressing, and eaten them as part of stews. But now that I’ve combined zucchini with puttanesca sauce, the possibilities for vegetables and sauce seem endless. 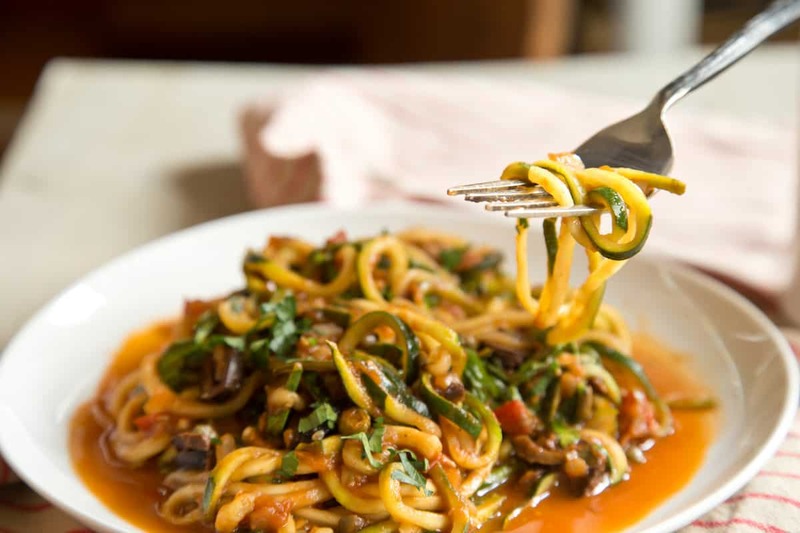 Vegan zucchini puttanesca made with spiralized zucchini noodles is a boldy flavored, surprisingly filling dish that won't weigh you down. Heat the olive oil in a large, high-sided pot (such as a 3-quart Dutch oven or sauté pan) over medium heat. Add the onion and sprinkle with 1/4 teaspoon salt; cook, stirring occasionally, for 3-4 minutes until the onion is translucent and starting to brown at the edges. Stir in the chopped tomato and cook for 2-3 minutes until softened. Stir in the garlic, olives, capers and brine, tomato paste, red pepper flakes, thyme, and black pepper. Reduce the heat to medium-low and cover the pan. Simmer for about 20 minutes, stirring occasionally. Add water 1 tablespoon at a time if the sauce gets too thick too quickly. 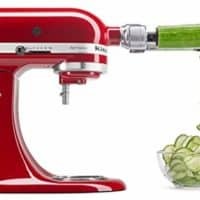 While the sauce is simmering, prepare your zucchini by cutting it with a spiralizer, a julienne peeler, a mandoline with julienne attachment, or by cutting the zucchini by hand into matchsticks or batons. Place the spiralized or cut zucchini in a large colander and toss with the remaining 1/2 teaspoon salt. Let rest for 10 minutes, then gently but firmly press and squeeze the zucchini to let excess moisture drip through the colander. Add the arugula, if using, to the simmering sauce and stir just until it wilts. Add the zucchini and cook, stirring, for 2-3 minutes just to heat through. Sprinkle with fresh parsley, basil, and/or cheese, and serve immediately as a hearty vegetarian entrée or bold side dish.